I am big fan of Bob Quinn's handles (especially the wood ones) and own quite a few. His Manchurian 2 band knots are first class. Now, for the first time, I ordered a HMW 3 band knot - spectacular! Soft as a Thäter and just the right density. I went with a fan first (26/50mm) and will likely follow up with a bulb as well. And of course, the Desert Ironwood handle, is fantastic! (12-01-2017, 04:40 AM)German Wrote: I am big fan of Bob Quinn's handles (especially the wood ones) and own quite a few. His Manchurian 2 band knots are first class. Now, for the first time, I ordered a HMW 3 band knot - spectacular! Soft as a Thäter and just the right density. I went with a fan first (26/50mm) and will likely follow up with a bulb as well. Nice brush! 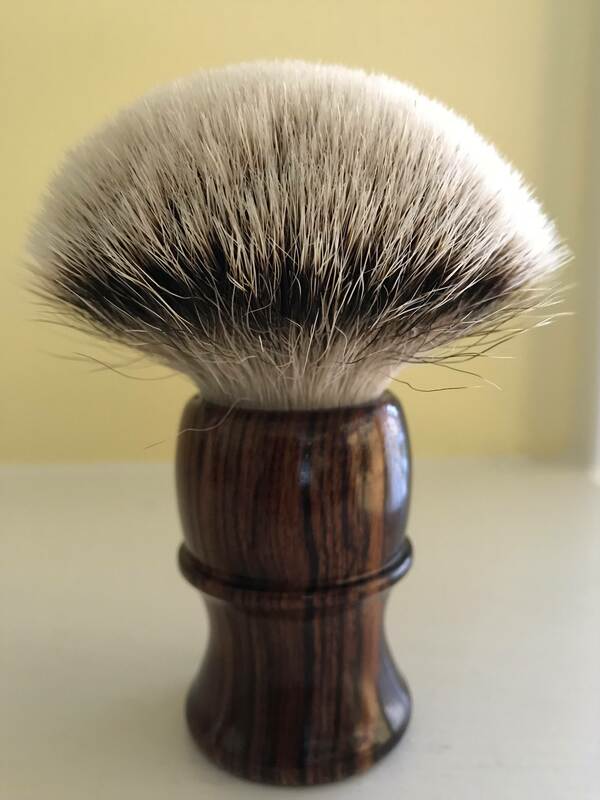 Some of my favorite brush handles are from Bob Quinn. I've also enjoyed his HMW 2-band knots, and it's nice to know about his 3-band. Yep, Bob has a quality product, for sure. Love his 2 band knots and am closing in on an HMW 3 band bulb for a special brush with Tom (wreck | fish). Very excited about this project! Bob does great work, indeed. Congratulations! I have an Azurite and Malachite handle with HMW 2-band. Enjoy the weight and feel of the stone handle, the HMW has great feel and performance. A favorite brush. I really enjoy my HMW and that handle is awesome. Georg, can you review the knot a bit? I’m interested to know how your knot specs are working out. Do you have any regrets about not going taller or shorter lofted? 26x50 seems like you’d have some density there with just right flow through. Thoughts? I would definitely not go higher than 50mm for a fan. You could probably go as low as 48mm to have more backbone. The knot is medium dense and will flex quite a bit, but is not floppy at that loft. 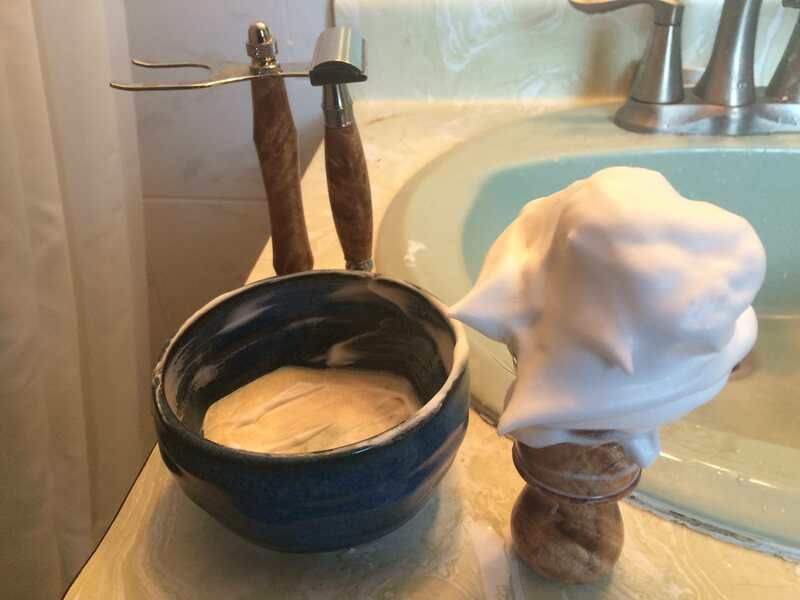 Super soft tips and a fantastic face latherer. I want to try the bulb as well. For super soft three bands a bulb is typically a better choice as the bulb provides naturally more backbone. For a bulb a loft between 52-54mm would be best I presume. Bob can certainly guide you there. Thanks for that. Yes, Bob is aces! I was interested in your musings with that particular knot. I'm considering the same loft in a custom handle from Tom, wreck | fish. We'll be installing a similar ER HMW soon, and I don't want floppy by using the traditional 1:2 ratio. Edit: By the way, the choice in shape of the handle displays the grain nicely. It sounds like a fun brush. I like the visual quality to the hair. Blooming'! How is the free loft with these knots? Can you set them higher and be free of a glue bump deeper in the base of the knot? Mine is set deep enough, no glue bump at all. I got a maple burl set for Christmas and love it. 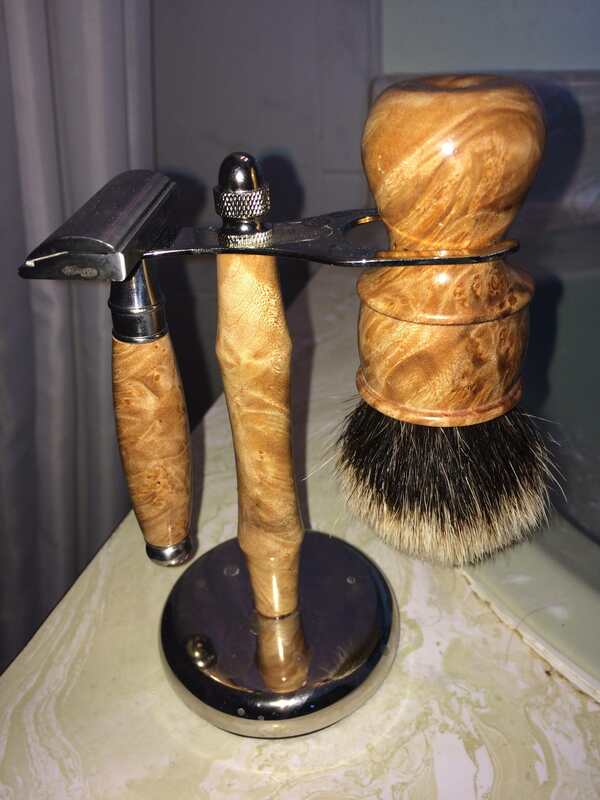 (01-06-2018, 06:53 AM)asiliski Wrote: I got a maple burl set for Christmas and love it.